Renowed judges, sports medicine experts, doctors and other speakers expressed deep concern at drug addiction and doping at a seminar on prevention of drug abuse and doping jointly organised by the Haryana Olympic Association and United Federation of Indian Journalists (UFIJ) at the RKSD College here on Sunday. Mr Justice TPS Mann of Punjab and High Court, Mr Justice JM Malik of Delhi High Court, Kaithal District Session Judge Mr HS Bhangoo, HOA president Khel Rattan Abhey Singh Chautala, HOA secretary general Dr Mohinder Singh Malik, chairman of All India Bar Association Mr Adish C Aggarwal, RKSD College Management Committee chairman Subhash Mittal among the dignitaries present on the dais. Dr (Mrs) Alka Beotra of Sports Authority of India, New Delhi, Dr PP Dass of PGI Chandigarh, Dr (Mrs) Bimla Bhatia of Chandigarh and Dr (Col) N K Bhatia were the experts who presented their papers at the jam-packed hall. 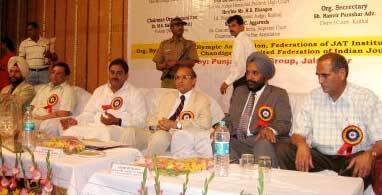 Speaking on the occasion, Mr Justice TPS Mann of Punjab and High Court said" due to socio-economic reason a sportsman is tempted to take performance-enhancing drugs to win medal and honour which can help him to live a comfortable life. Consequently, the Indian athletes tested positive in the Hyderabad Games." "Living a comfortable life is not a sin. But achieving it, they should not resort to unfair means. It is sinical and calculated manipulation" said Justice Mann. Without naming the lifter, Justice Mann said a lady weightlifter was tested positive and banned. "It was a tips of an iceberg. Fearing they may not be caught, Indian weightlifting probables disappeared from the National Camp at NIS Patiala, on hearing that WADA team is visiting Patiala." This is a serious challenge our society is facing. Mr Justice JM Malik said "drug abuse is destroying very fabric of our society. Rapid industrialisation, frustration, failure in business, lack of parental care are some of the reasons why people in general take to drugs." Asking to keep politics out of sports, Mr Justice Malik suggested that each state must have a forensic laboratory. "It has been noticed that the police present the challans but the report from the forensic laboratory is received very late." HOA President Chautala said "drug abuse and doping is a big evil. The organisation of such seminars is a sincere effort on the part of the HOA to educate the public and the sportspersons to refrain themselves from taking drugs. The HOA wrote letters to schools and colleges to educate the students about the ill affects of drugs.The Kaithal Bar Association approached the HOA and taking responsibility to organise this seminar." Mr Chautala urged the judiciary to issue directions to the Government in this regard. HOA secretary general and former Director General of Police, Haryana, Dr Malik, IPS (Retd) said "the HOA has launched campaign against drug abuse and doping. The first seminar on drug abuse and doping was conducted at Jat Bhawan in Chandigarh. The next will be held at Sirsa. We are encouraged with the response from the public and various organizations." Kaithal District Sessions Judge HS Bhangoo said " General awareness is required to eradicate drug abuse and doping. It should begin at home and continue in schools. Police and judiciary have a big role to play." Chief coordinator Dr MS Shah and organising secretary Mr Ranvir Parashar did a good job in organizing the seminar in a professional way.